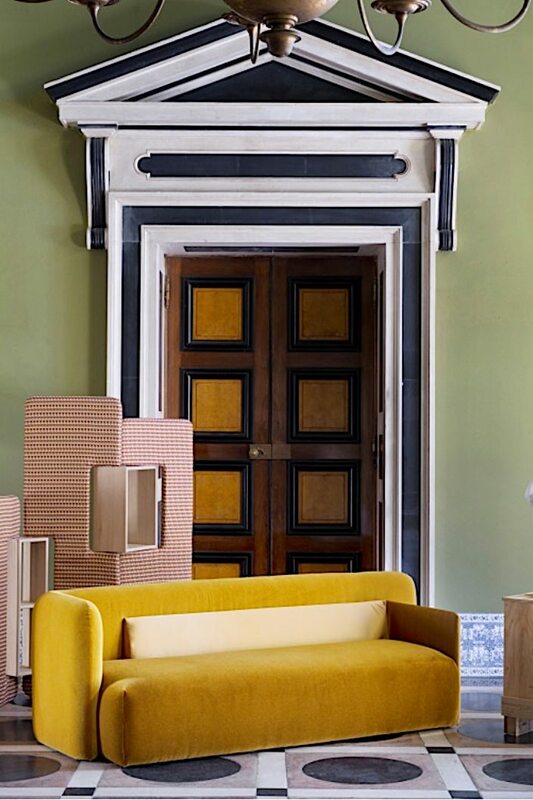 In case you were puzzled by the title of this post, let me assure you it does not refer to new age crystals or advanced rocket science, but rather themes of geometric forms and metallic threads I noticed throughout many collections at Paris Deco Off. One place these qualities met with sophisticated style and outstanding craftsmanship was in the three collections that comprise Créations-Métaphores: Métaphores, Vérel de Belval and Le Crin. Taking inspiration from the sparkling sky, their new Cosmos collection embraces the mysteries of the universe with astral themes, and subtle metallics. Discovery, above left and below, sets the tone with nebulae like forms sprinkled on a close-grained velvet, echoing the dazzling spiral galaxy of the Milky Way. 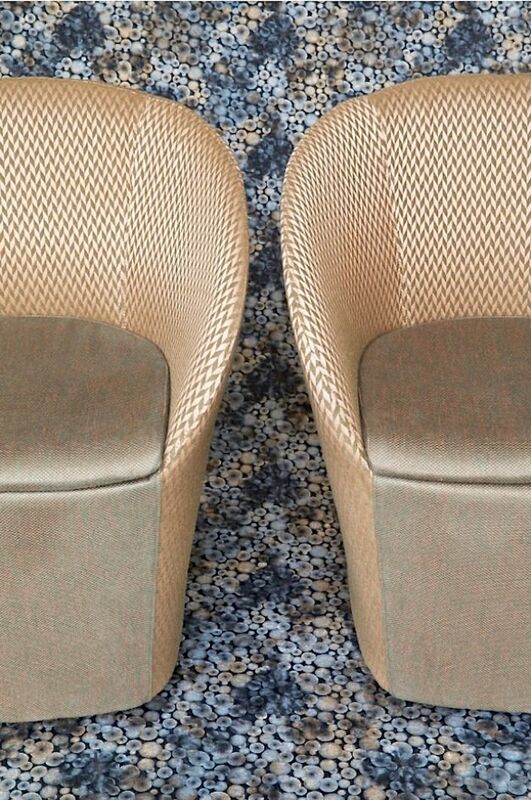 In Zodiac, the small patterned geometric jacquard on the chairs above, the contrast between the two colors in matte and smooth creates a sophisticated interplay of understated sheen. Adding lurex thread to a short pile cotton velvet, Belle Etoile, above and at top right, as its name suggests, creates a subtle sparkle with understated bling. Prisme’s three dimensional jacquard, above, references the crystalline structure of moon rocks. 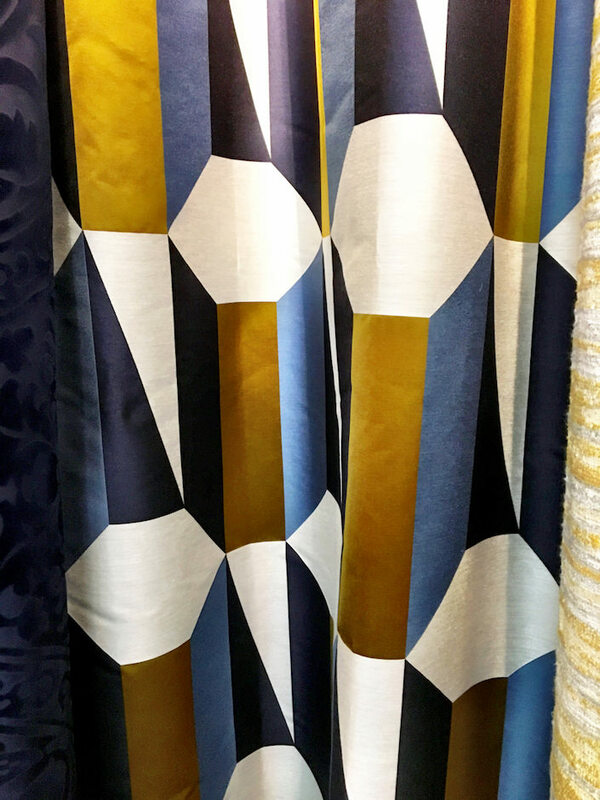 This small geometric is a versatile size and pattern for both upholstery and curtains. But blow it up and you get Megaprisme – a favorite fantastic bold and modern pattern oozing with flair. 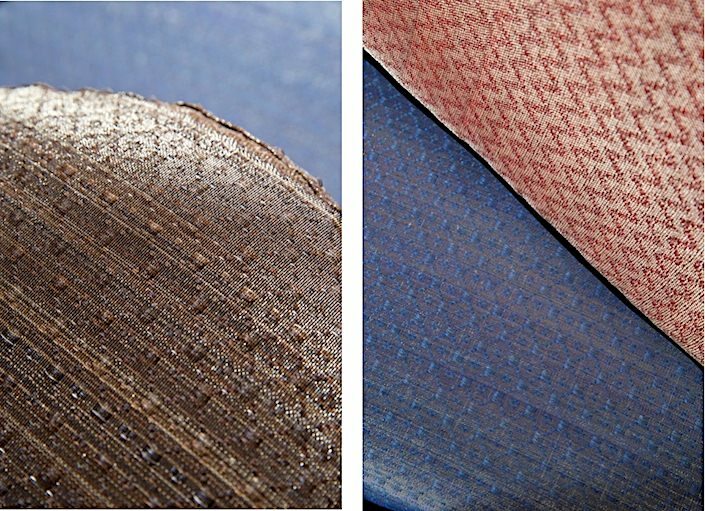 Metallics make an understated play in Mica, top 2nd from left, a cotton-linen blend woven with lurex and Biarritz, below, a linen and wool inspired by the ocean’s beaches in this French seaside resort town and how they look from space. 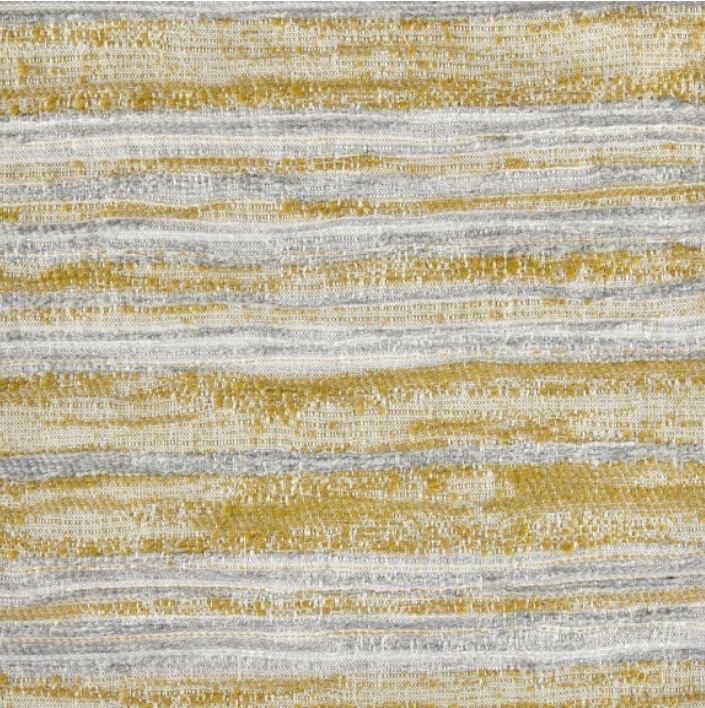 Stardust is a contemporary geometric with a twist. 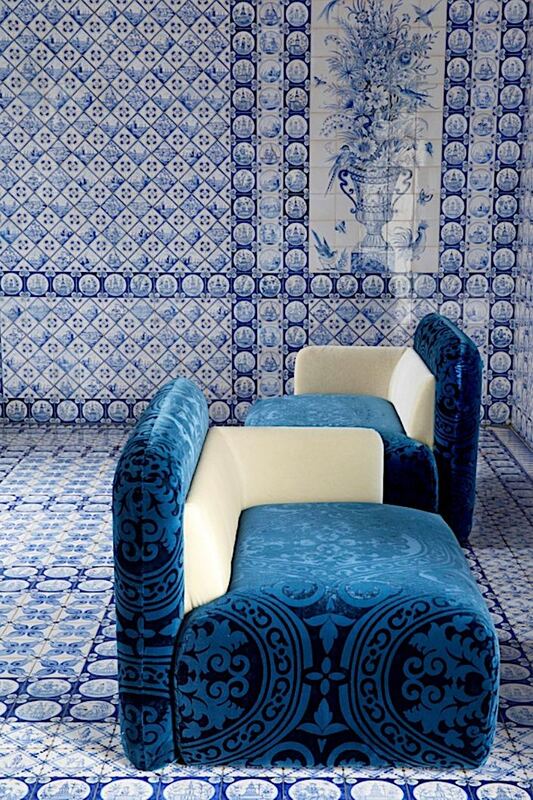 A laminate is sprinkled on a jacquard that alternates matte and smooth areas. Available in 11 colorways, two, including a trending yellow, are seen below. 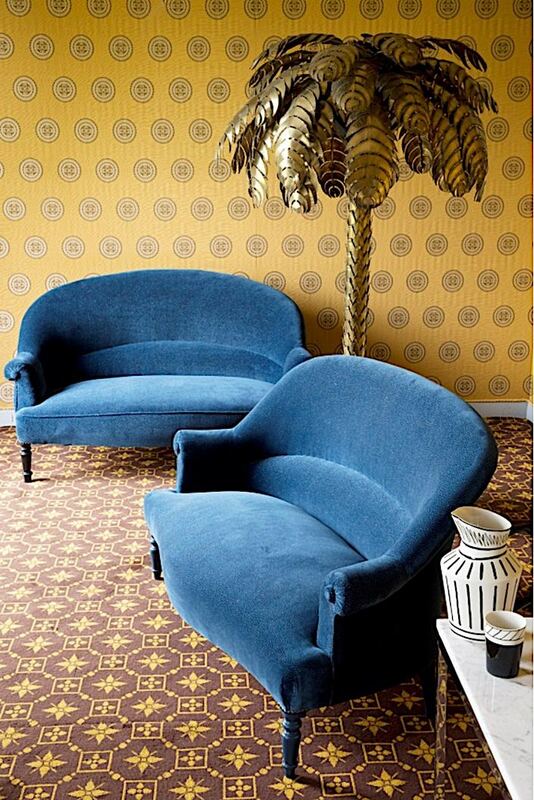 From Vérel de Belval comes Montaigne, an impossibly luxurious mohair velvet, seen above and below. It is impossible to describe the incredible hand of this fabric which employs 100% baby mohair fleece from the very first shearing of Angora goats. There are only three mills in the world capable of weaving such fine mohair yarn and once you feel it you will understand. The palette of 19 rich colors is inspired by the saturated hues of the cosmos, from the deep blue of the night sky to the golden rings of Saturn to the vibrant reds of Mars. 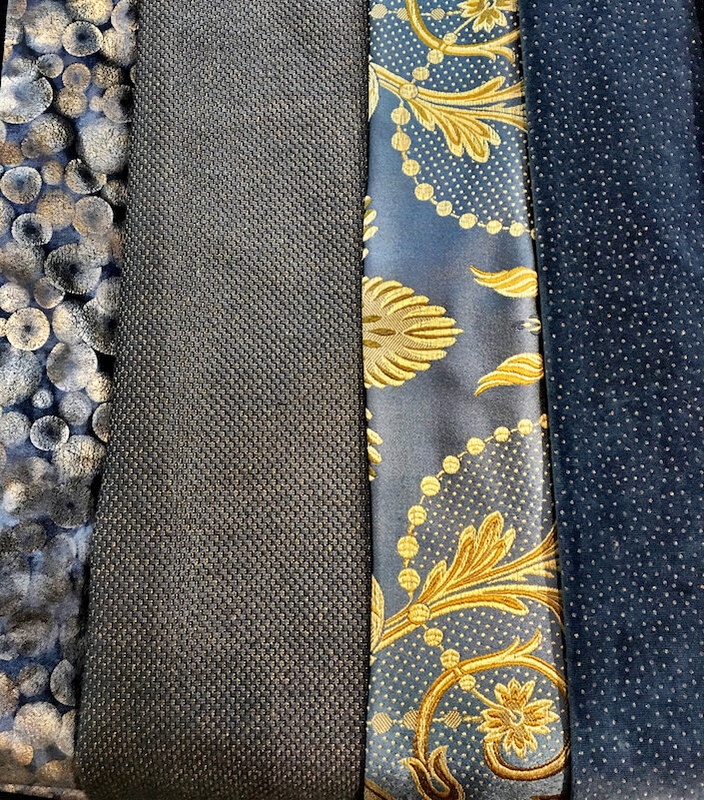 With a distinguished two hundred year old heritage, Vérel de Belval is known not only for its exquisite Lyonnaise silks and lampas, but also damasks, specialty taffetas and silk velvets. 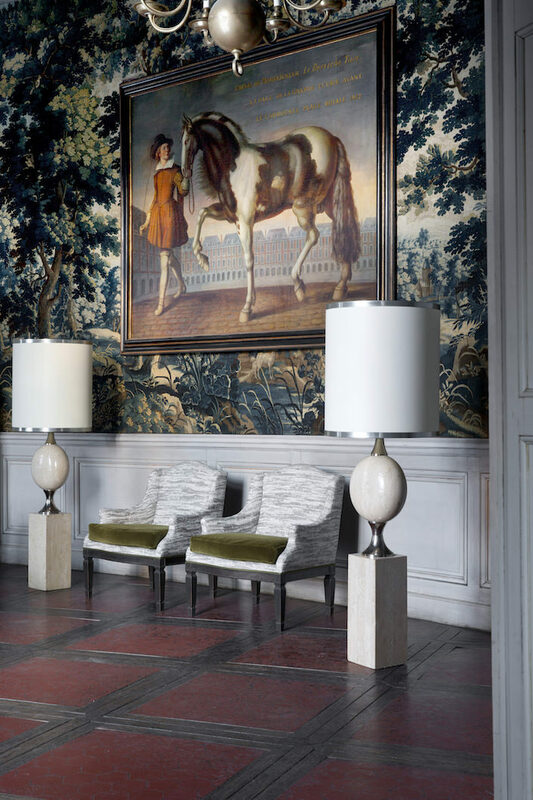 And while you may think of velvet damasks as old fashioned, see how modern and chic the new Impérial looks below, shot at what looks like the Tartar Tent at Château de Groussay. 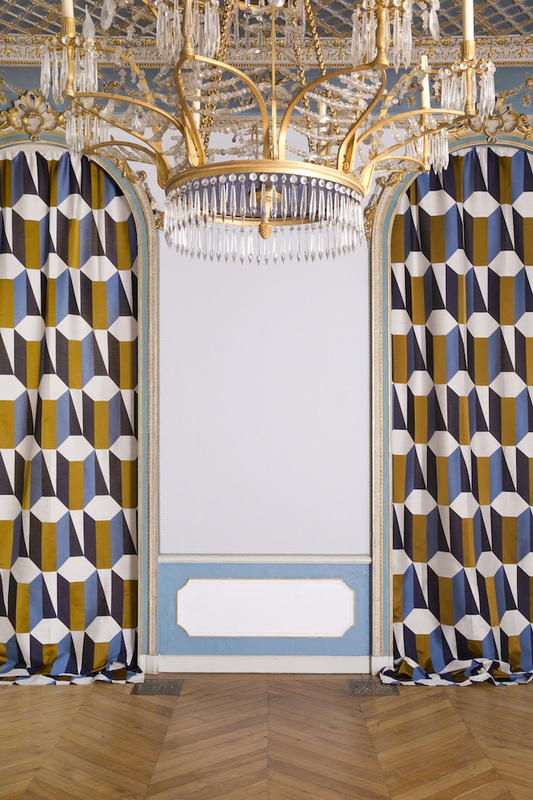 Inspired by the 19th c. patterns adorning the salons in Empress Eugénie’s palace in Biarritz, the new blown up scale scale gives the ton sur ton design a fresh and daring edge. 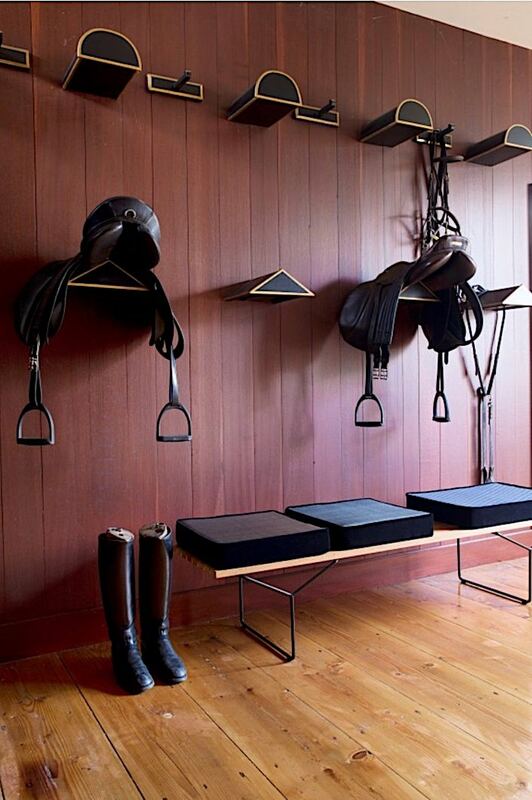 as in a stylish tack room! 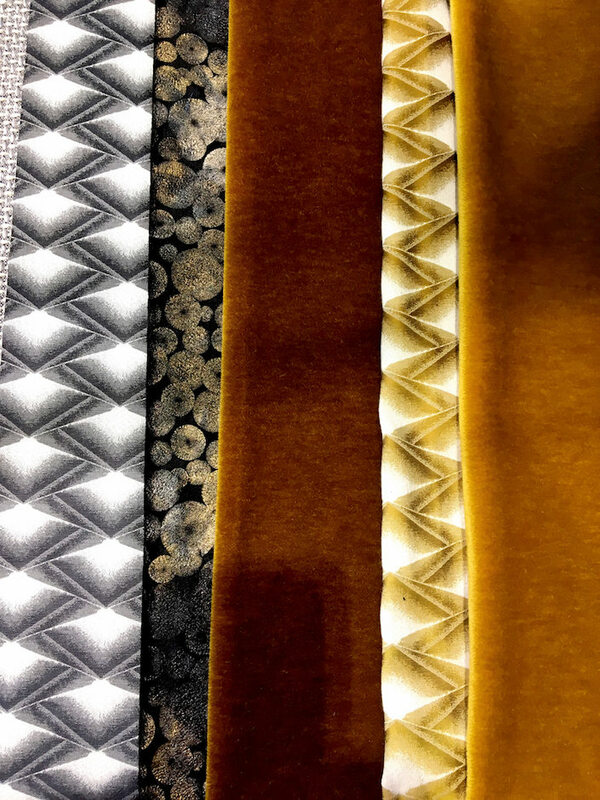 And Apparat and Gala, below, mix the tradition of horse hair with the sheen of lurex, resulting in innovative traditional woven jacquards that are chic and discreet! Créations Métaphores is a collection of supreme sophistication and understated chic appropriate for traditional or modern environments. 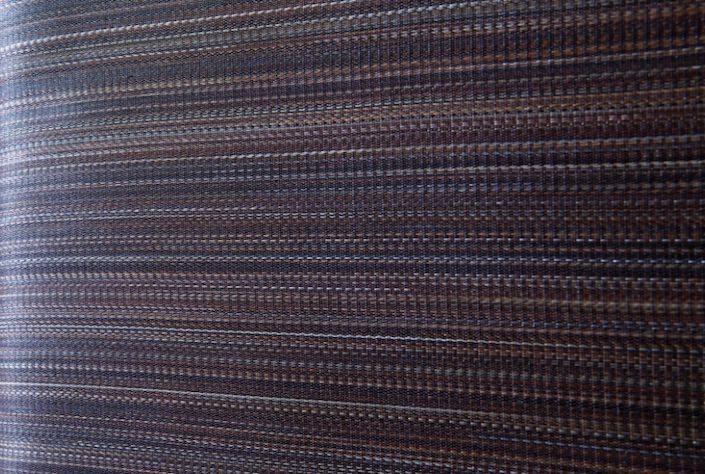 Within the three lines, Cosmos encompasses a wide variety of materials and textures of both historic and contemporary designs that encourages creative and elegant solutions. This entry posted in interior design. Entry Tags: Créations Métaphores, Fabrics, interior design, Paris Déco Off Bookmark the permalink. I love that blue velvet! Perfect shade. 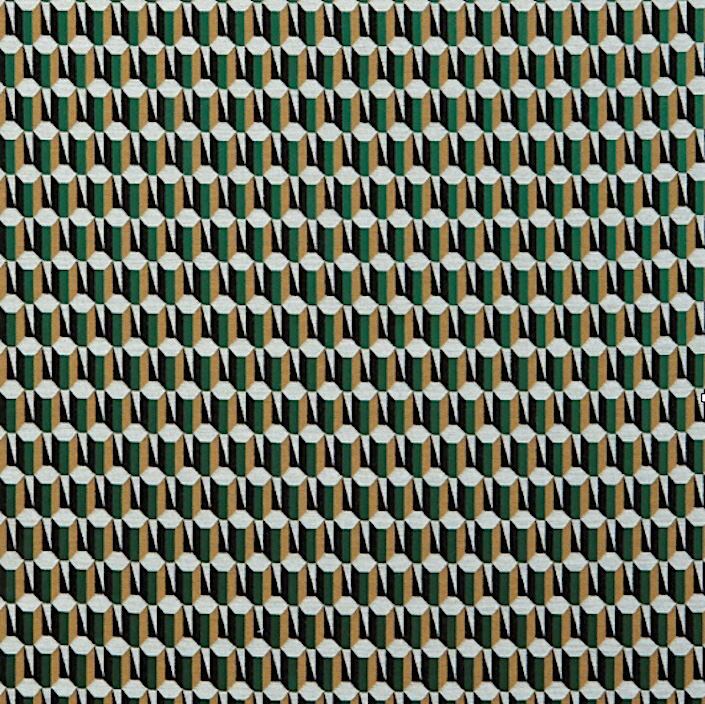 80 queries in 0.443 seconds.